A drive or bike ride around the Lake is a lovely way to spend a day, but an even nicer way to spend some time is stopping at the sites around the Lake and taking part in community events. If travelling from the Sydney area on the TCH be sure to stop at the Bayside Garden Centre and Charlene’s Bayside Café to fill up on chowder & tea. Take a right onto Route 252, which will take you to Route 395 East Lake Ainslie. If you are coming from the Canso Causeway on the TCH, take a left in Whycocomagh onto Route 252. 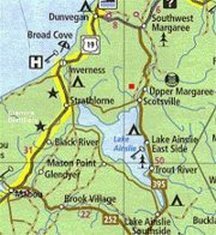 If you are coming from Route 19, in the Strathlorne area near Inverness, take the Strathlorne- Scotsville Road which connects to West Lake Ainslie or Route 395. By now you should be ready for dessert, so stop at MacKinnon’s Campground for some ice cream. MacKinnon’s is one of two campgrounds on the East side of the Lake where you can tent or stay with a travel trailer. 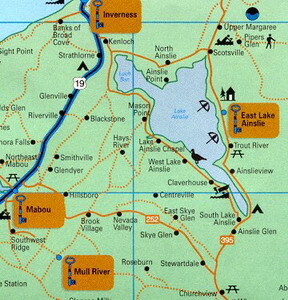 Along with MacKinnon’s Campground is Ainslie Village, with views of the sunset and access to the Lake. Next stop is a swim or a walk along the beach at the Trout Brook Provincial Park Beach, which is a beautiful sandy beach with warm water and beautiful views. From this beach you can see eagles flying overhead, or watching the Lake for their next meal. This is also a great area to stop to fish for an afternoon. To learn about the history & culture of the area, stop at the MacDonald House Museum where you can learn about life of early settlers at Lake Ainslie. On the Museum site you can explore the MacDonald house, one room schoolhouse and barn. The site itself has gorgeous views of the Lake and walking trails on site. Arts & craft are alive and well at Lake Ainslie, and the second art gallery you will come across is Kirkwood Gallery. Kirkwood Gallery is also an antique shop and the proprietors are very knowledgeable about the history, culture and nature of Lake Ainslie. You will be certain to find a one of a kind item at the Kirkwood Gallery, whether it be a painting or an antique. (Hours: Wed. to Sat. 10am to 5pm, and on other days or evenings by chance or appointment). Genealogy & history buffs can stop at the MacKinnon Cairn commemorating a highly accomplished family from the area, or can view the monuments at local cemeteries, including the Pioneer Cemetery of the area’s earliest settlers. If you are in the area on a Wednesday night be sure to attend the weekly adult square dances at the Lake Ainslie Volunteer Fire Hall in Scotsville. While in Scotsville you can also stop at Patterson’s General Store to fill up on snacks or to mail some postcards, and stop to check out the Margaree River. You are a very short drive to Egypt Falls and the other scenic areas of the Margarees. Turn left at Patterson’s means you leave Route 395 and you are now on the Strathlorne- Scotsville Road heading toward Kenloch and Inverness. Before leaving Scotsville, stop in at the Scotsville School of Crafts, owned by the Lake Ainslie Weaver’s & Craft Guild where you will find one of a kind items in the gift shop with local hand made goods, woven, knitted, sewn, as well as art and other hand made crafts. The School of Crafts is also a C@P site where you can access the Internet to check your e-mail, make photocopies or send a fax. The drive or bike ride through Kenloch will give you beautiful views of the Lake. When you arrive at the fork in the road, take a left and you will now be travelling along the West side of Lake Ainslie. As you continue along on the West side of the Lake you will also find places to stay, such as Nowen Family Cottages or the lovely Tulloch Inn. You can also have a fantastic home cooked meal at the Tulloch Inn. Enjoy the Lake, community events, history and culture of the area. Lake Ainslie Firemen’s Ceilidh Days are a highlight of the summer, as are the weekly dances and a trip to the MacDonald House Museum has something for all ages. In the Fall the Lake Ainslie Weaver’s Guild will host events as part of the Celtic - Colours International Festival, and there are trails for snowmobiling and cross country skiing in the winter as well. For more information including a full interactive map check out the Map & Directory page of the website, and please check the Community Calendar for date and times of events to take part in. To find out about local events, pick up a copy of the Inverness Oran Newspaper, or check the Music Cape Breton website for up to date listings of live music and dances.